With this happy late night task before me, there is still something unsettling about attempting to review a production that is so epic in scale, and so monumental in its achievement, that I most certainly could never fully do it justice within the newspaper world’s limits of time and space. But such is the case with the John Cooper School’s wondrous production of The Secret Garden. Based on the novel by Frances Hodgson Burnett, with book and lyrics by Marsha Norman, and music by Lucy Simon, this very courageous edition, featuring inspired direction from Joseph Demonico, is nothing short of splendid. My use of the word “courageous” was not without purpose. It expresses my overall impression that the folks at John Cooper have essentially taken on the impossible task of training secondary school students to perform this extraordinarily complex and sophisticated musical, and against all odds have pulled it off magnificently. Among the twists and turns in the plot line there is, of course, a mysterious secret garden that young Mary discovers on the estate. Another household secret is the well-hidden (and bedridden) Colin, who never comes out of his room. And of course there are strange noises in this house. Now we cannot discuss the manor house, or the soon-to-be-lovely garden, without mention of the creative set designer, Darwin Gilmore, now a senior at my alma mater, the University of Texas in Austin. Working with scenic artist, Rod Flower, and stage manager Aamer Rakla, Gilmore’s smooth concepts allow house to become garden, garden to become house, and walls to lift clear to reveal action in the rooms. Well done! There was also shadowy and mysterious lighting from designer, Lauren Gallup. The blood-red abstract designs of the “Opening Dream’s” silken backdrop grabbed the audience attention and then suddenly vanished as though this were a magic show. The focused intensity of that number’s outstanding ensemble singing, coupled with the exotic Indian dancing for a knockout opener. With choreography by Elizabeth Demonico, dance would frequently highlight beautifully mounted scenes like “A Girl in the Valley,” with its lovely waltz, and the exotic Act II “Come Spirit, Come Charm” ritual dance in the garden. It looked like Cecil B. DeMille had staged it for Hollywood. Add to that success the amazing work of orchestra conductor, Bob Scannell, who right from the soothing strains of the Overture was able to guide his young musicians to skillfully playing this full Broadway score of very considerable difficulty. 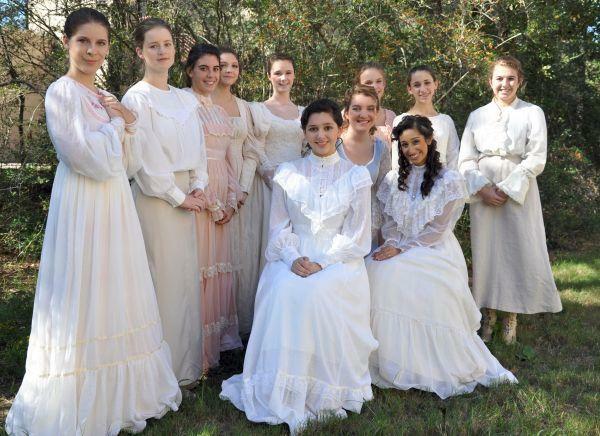 The Secret Garden will be performed today at 2 p.m. on campus in The John Cooper School Performing Arts Center. Tickets are $15 for adults or $10 for students and seniors, and can be purchased online at www.seatyourself.biz/johncooper.